More than snow and ice lie packed beneath glacial plains and frigid mountain summits. Step into the snowy domain of all manner of cold-hearted creatures with GameMastery Map Pack: Ice Cavern. No Game Master wants to spend time drawing every winding tunnel or razor-sharp icicle. Fortunately, with Paizo Publishing's latest GameMastery Map Pack, you don't have to! This line of gaming accessories provides simple and elegant tools for the busy Game Master. 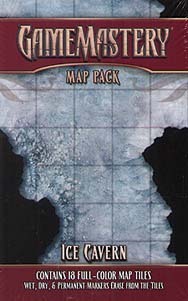 Inside, you'll find 18 captivating 5"x8" map tiles designed to help you create any frozen dungeon you can imagine, from rimy tundra thoroughfares to intricate ice labyrinths. Multiple packs link together seamlessly, allowing you to create even more elaborate and deadly dungeons. Game Master shouldn't waster their time sketching maps every time their players dare to delve Arctic extremes. With GameMastery Map Pack: Ice Cavern, you'll be ready next time the adventure takes your heroes into the cold!